In 2018, Blue Cross Blue Shield of Massachusetts made a quarter-million-dollar investment in Drug Story Theater, becoming DST’s largest investor to date. The funding is designed to promote the expansion of the program, allowing it to increase the number of school district partners each year from 17 to 60, with the potential to reach 16,000 students around the state annually. Blue Cross has a strong commitment to addressing the opioid epidemic. In a recent Blue Cross opinion survey, Massachusetts residents rated the opioid crisis as the number one issue facing the state, with a majority of respondents reporting that they know someone who is addicted. Michael, Jared, Emily, Shana, Heather and Jacob in "The Price You Pay"
In August, 2014, Dr. Shrand began Drug Story Theater’s Pilot Program. As the Medical Director of CASTLE (Clean and Sober Teens Living Empowered), he was able to identify a group of teens who were in the early stages of recovery from substance abuse. He offered them, and their parents, a novel form of treatment that combined individual, group, and family therapy, deep brain neuroscience psychoeducation, and the opportunity to give back to the community: the result was Drug Story Theater. Dr. Shrand recruited a Director to teach the teens and their families’ improvisation and various aspects of theater while they shared their stories of drug and alcohol use and how it affected their personal lives. 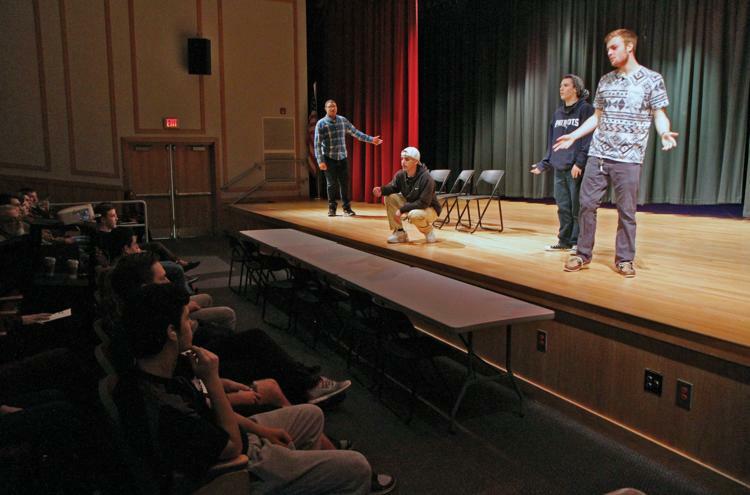 At each weekly meeting, Dr. Shrand used improvisational theater and psychodrama techniques, providing powerful therapy for these teens and their families needed to facilitate their own recovery, while simultaneously teaching them about the brain science of addiction. A Script Writer attended and participated in each session, and wove a scripted play from the teens’ stores of their seduction of, addiction to and recovery from drugs and alcohol. In between each scene of DST’s first 40 minute “The Price You Pay”, performers would step out of character and present an interactive Power Point slide about what was happening in the adolescent brain. Using state-of-the-art neuroscience, the audience was taught about the pre-frontal cortex, the limbic system, and how the adolescent brain is at highest risk for life-long addiction. The audience learned about the interaction between dopamine and oxytocin and how this influences the relationships teenagers have with their parents and others in the world. Shana performing in "The Price You Pay"
After six months of therapy and training, the pilot program of DST created and produced the play called “The Price You Pay”. The Premier was first performed at Plymouth Community Intermediate School(PCIS) in June, 2015 to an invited group of stake-holders including Senator Vinny Demacedo (R) of Plymouth, then-State Representative Jim Cantwell (D) of Marshfield and Scituate, Plymouth District Attorney Tim Cruz, The then-President and CEO of Beth Israel Deaconess Plymouth, Peter Holden, the President and CEO of High Point Treatment Centers, Daniel Mumbauer, The Register of Probate, Matt McDonough, and other dignitaries that made up a standing room only crowd of over 120 people. Between September 2015 – June 2016 the Pilot DST troupe performed “The Price You Pay” over twenty times, reaching more than 10,000 students, parents, educators, and townsfolk throughout the South Shore. Before each performance the audience completed a survey, answering questions about the limbic system, the pre-frontal cortex, dopamine, and oxytocin. The same survey questions were administered after the show. In addition, the survey asked questions like “Do you think Marijuana is Addictive?”, “Did this performance change your perception about the effect of drugs and alcohol on your ability to succeed at school?”, and “Did this performance change your perception about the effects of drugs and alcohol on your relationships?” Of the 1,310 students who answered the survey, 90% answered that they would recommend the show, and almost 40% of students felt the show should be seen by middle schoolers. The data has been analyzed by Dr. Kenneth Texeira, PhD and his team at Quincy College. These survey tools have also been used to track substance use 30 days after seeing a DST performance, with the goal of seeing a reduced usage of substances. Some of these results were presented at the 2016 American Academy of Child and Adolescent Psychiatry Convention in New York City. Drug Story Theater is an evidence-based model where "the treatment of one becomes the prevention of many."